Pianist Hod O’Brien, who has been described in the Los Angeles Times by Don Heckman as “a masterful bop-based improviser”, was born in Chicago, Illinois, on January 16, 1936. At the age of six weeks he was adopted by a musically-oriented couple and so it was no surprise that he eventually began playing piano. After listening to the Jazz At The Philharmonic records, he became hooked on bop by age 14. Beginning in the 1950’s he played with a long list of great jazz artists, including Donald Byrd, Art Farmer, Zoot Sims, Oscar Pettiford, Kenny Burrell and others. In the early 70’s, O’Brien left jazz, returned to school at New York University and studied psychology, computer programming, and composition. He then got a job as a research assistant at the university. A few years later, O’Brien and a friend and fellow musician, Roswell Rudd, opened their own jazz club in New York City. They called it St. James Infirmary, and even though it was only in existence for a year, it gave O’Brien the opportunity to play in the house band, backing such visiting artists as Al Cohn, Archie Shepp, Chet Baker and Pepper Adams. 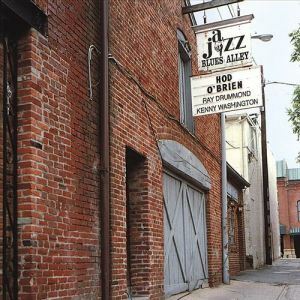 Unlike many jazz pianists, O’Brien has consistently stayed true to his bebop beginnings and has refused to modify his personal style to mimic Bill Evans or McCoy Tyner. This insistence on purity, if you will, has earned him a large following among jazz lovers in Japan. Hod O’Brien has not been a particularly prolific artist in terms of records released, which makes this week’s subject disk all the more special. “Live At Blues Alley – First Set” was released by Reservoir Records in 2004. It was followed by two further discs recorded that same evening, which I will not be discussing this time. “Live At Blues Alley – First Set” consists of seven songs. The set opens with a Bob Dorough composition, “Nothing Like You Has Ever Been Seen Before”. This is a great number to get things off and rolling, lively and happy and melodic in a way that a lot of O’Brien’s contemporaries never learned. With large groups, especially those that include horns, there is always the danger that one or more band members will see their contribution, either naturally or in the mixing room, relegated to irrelevance by the louder members of the group. In a trio, however, there is no such worry. For good or for bad, every musician can be heard in sparkling clarity. In this case, it is for good, and when “Nothing Like You…” ends, the audience is not stingy with showing their appreciation, and rightly so. Because of its title, you may think of the next song as a little something to pass the time but not really serious music. If so, you better think again. “Frog’s Legs” was written for Ben Webster by Joe Zawinul of Weather Report fame in the early 1960’s. Webster and Zawinul were friends and also roommates for a while at the time. O’Brien’s handling of Zawinul’s piano part is absolutely a masterpiece. While this trio lacks the tenor sax of the song’s namesake, the trio does a wonderful job of keeping the song moving forward at a pace that never slackens. The next song is from the pen of bebop pianist and composer Freddie Redd. In his introduction to the song, O’Brien calls it obscure, and I have to say until I acquired this disk I never had heard of “Thespian”, except in the normal sense of the word. The first three minutes of “Thespian” is a big change of pace from the first two songs, and when the pace does quicken, it catches you by surprise. Just when you are thinking you know what to expect from this song, O’Brien stands you on your head shakes all the change out of your pockets. “Thespian” is a great song whose obscurity is a undeserved, as I’m sure you will agree if you hear it. Mel Rhyne’s “It’s Love” is up next. This one runs a little over nine minutes long, making it the longest song in the set. O’Brien has a knack for taking songs that you think are going to be sedate and rather, well, boring, and turning them into something intensely interesting. Which is not to say that love is boring, but love songscan sometimes put you to sleep faster than one of televangelist Pat Robertson’s diatribes. “It’s Love” is a great song. The guys keep it light and quick and you’re gonna love it. The live audience sure did! The next song, “Lullaby Of The Leaves”, is another one I had not heard prior to obtaining this disk. The composer was likewise previously unknown to me, Bernice Petkere (pronounced “pet-care”). She was apparently no slouch in the composing department, however, as no less a luminary than Irving Berlin called her the “Queen Of Tin Pan Alley”. I don’t know the provenance of “Lullaby Of The Leaves”, but it’s a quietly catchy piece of music that O’Brien and the guys do a superb job on. Bassist Ray Drummond get a lot of exposure in this one, which draws appreciative applause from the audience. While this is hardly the liveliest song in the set, it is anything but a snooze job. Johnny Mercer’s “Tangerine” takes off running from the git-go. Unlike the previous songs, “Tangerine” is hardly an obscure masterpiece but rather is a popular standard. This group’s performance here is, as with the rest, superb. If there is such a thing as a song that the term “standard” would be considered an understatement for, “By Bye Blackbird” surely is that song. It was written in 1926 by Ray Henderson and Mort Dixon. It was first recorded by Gene Austin in that year, and was wildly popular. O’Brien, Drummond and Washington give us a delightful version of this song. Drummond once again gets a nice solo and a warm bit of applause. Jule Styne’s often-recorded standard, “Just In Time”, closes the set. The guys are taking it home with this one, and it’s a pleasure to just sit back and listen to it unfold. O’Brien has been an underrated talent his whole career. It’s nice to hear that in the years since “Live At Blues Alley – First Set” was released, things have picked up for him. I firmly believe you will find “Live At Blues Alley – First Set” to be a fantastic addition to your personal playlist, for a Saturday or any other night! A more extensive discussion of this album and its two companion discs can be found here. There is a nice JazzTimes article about Hod O’Brien that you can read here. Your comments about this article and/or the subject are welcome! Please use the “Add a comment” area below. Rude, abusive comments and spam will be deleted. Copyright © 2012 by Al Evans. All rights reserved.